Ok all you moms out there. 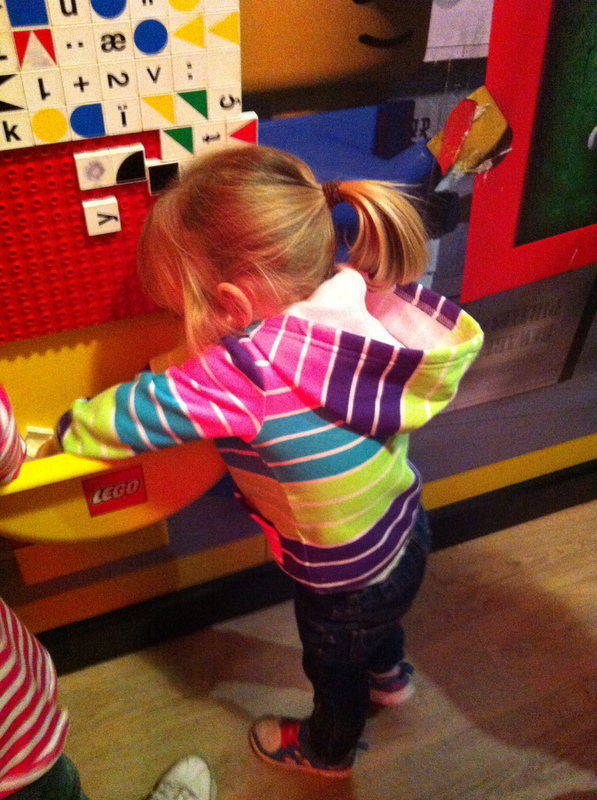 We took our kids to Lego Land over the Christmas holiday. They were super excited when we told them it would be part of there Christmas from us. To say that excitement filled the air on the day of our visit would be an understatement. The kids were stoked!! We ordered our tickets online and printed a confirmation. This saved us a little money, although not as much as they stated on their site….be prepared for that. What was supposed to be $11.25 for kids and $16.25 for adults ended up being about $1 more each. However, if you plan to visit after 4pm during the week, you can save even more. Also, kids 2 and under get in free (there’s a reason for that…). We arrived at Grapevine Mills Mall, which is just outside Dallas, around 2:30 on Saturday. Our entrance to Lego Land was supposed to be at 3pm. The line was snaked around outside the attraction. The good news is it was relatively easy to figure out which line we were supposed to be in and it moved relatively quickly. Once inside they process your ticket info and herd you toward a holding room with a Lego video playing and a couple of play areas for the kids. There is a countdown above the door for your scheduled tour. Once inside this area, you are given a very short “tour” of sorts of the Lego factory. Ours was performed by a young lady who sounded a bit like this might have been the fortieth time she had done it that day. In her defense, it was very crowded due to the holidays so it probably was the fortieth time she had done it that day. Each child got a souvenir lego toy and we moved on to the next section, another line, and more waiting. This line was for a ride where you shoot laser guns at different villains and they snap your picture while doing so. Kids loved it but I thought it should have been a bit longer. Our next stop was a gigantic replica of Dallas and Grapevine. Awesome doesn’t even do this thing justice. I mean the entire thing is made of legos. My mind can’t comprehend how that is even possible! We made our way to the next area and studied our map of options. The first was a large indoor play area similar to what you see in all the fast food joints. The kids lined up, took their shoes off, and waited for entrance into the play area. I was thankful they had a worker manning the gate and asking where each child’s parents were. He would not let any child in or out without physically laying eyes on their parents. Next was a go-cart track with lego looking cars. Again, an extremely long line for a really short ride. It left me and my youngest entertaining ourselves for quite some time because she was not big enough to ride in the cars. In fact, this was something we ran into with almost every activity. She did not meet the height requirements for anything. That explains why she got in free…. Insert fit of frustration by a two year old that does not understand why her brother and sister are getting to ride and she isn’t. Yes, that is her in the corner on the floor. It was a glorious moment. Momma got smart and hunted for something else for us to do while the others drove lego cars. I found the little kids area! (Insert huge sigh of relief here). 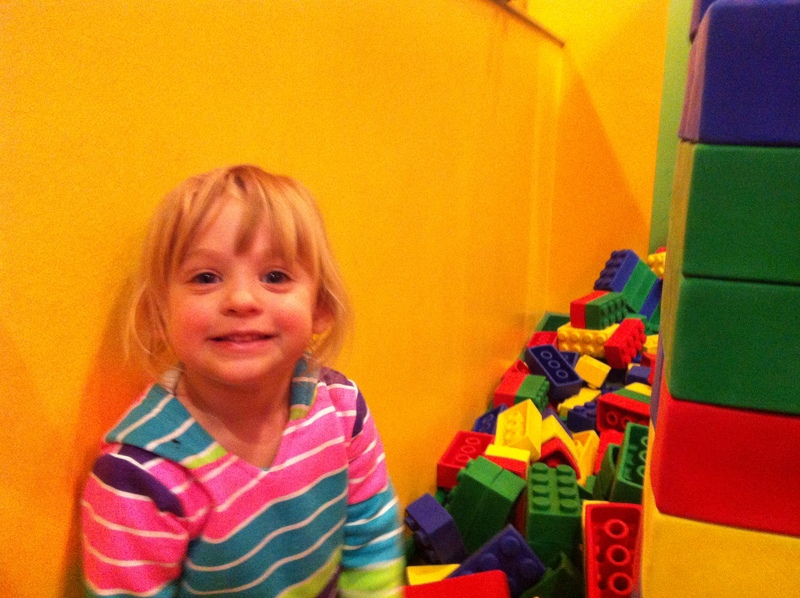 It was full of giant rubber legos and tons of regular legos, plus a toddler sized slide. My youngest was ecstatic and quickly forgot all about the driving issue. After reuniting with my older two and Daddy, the girls decided to head to Princess Palace while the boys went to build and race their own lego cars. Upon entering Princess Palace I felt the huge deflation of disappointment. I guess we have high expectations. I was thinking there would be princess themed stuff in there or something. I mean, Princess Palace kind of leads one to believe there would be princess-y stuff in there. Well, there were only about 4 flower shaped tables that, I’m assuming, were supposed to be holding legos. However, there were no legos. The only thing in there was a karaoke machine complete with some trendy Bieber songs (and a few Taylor Swift ones) and an overused microphone that was taped together. Not impressed, can you tell? The girls got up there and attempted to sing a song only to be drowned out by someone else’s obnoxious father that came in after us. I’m guessing he thought he was being cute singing along and all, but my girls just stopped and looked at him like he was weird. And he was. After our less than glamorous experience in the Princess Palace, we headed to the last attraction, which was another ride. It was a Harry Potter-ish themed ride where you pedal to go higher as the thing spins. Adults can ride but let me just tell you, it is cramped. Kind of difficult to pedal effectively when your knees are in your chin. Overall, our kids enjoyed themselves. We made memories and enjoyed time with our family while exploring one of the local attractions here in Dallas. Would we go back again? Only if our kids begged us…. p.s. Eat before you go. Almost $5 for a hotdog is outrageous! 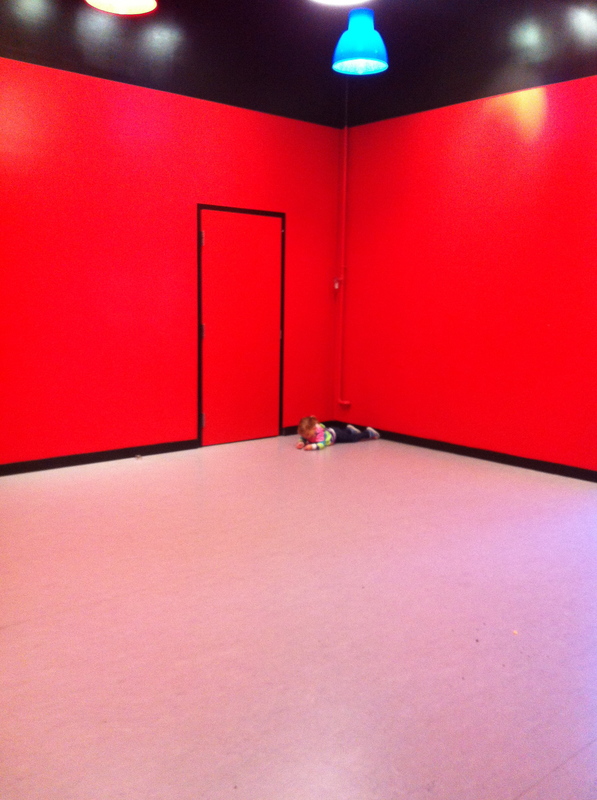 Your baby girl in the corner of the big room….priceless! You probably didn’t really need a picture to remember that! 🙂 Sounds like a good experience even if it wasn’t as fun as you expected. Haha! I treasure even the not so glorious moments 🙂 they are all gifts. We did have fun though. Yes! Me too. It cost us about $60 to go. Totally agree Erica! I was disappointed too. But same as your kids, my kids seemed to love it. Go figure…. lol! 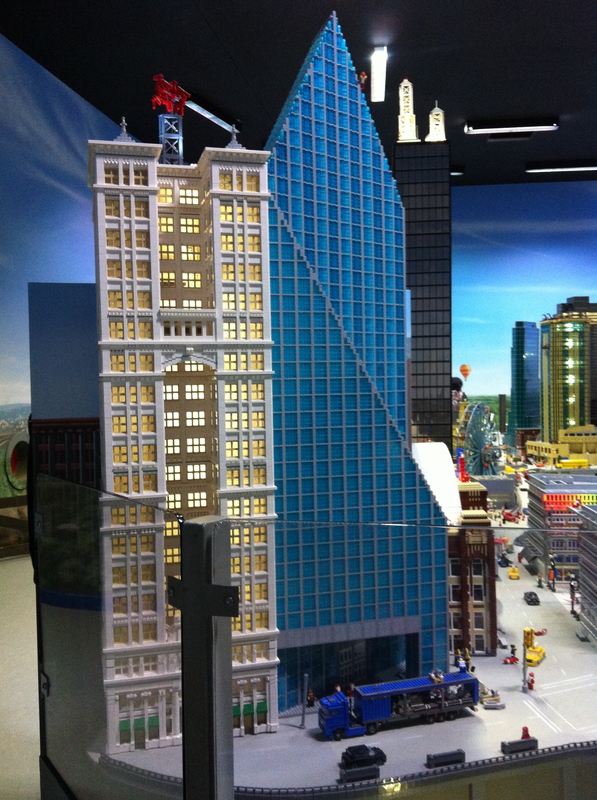 This entry was posted on January 7, 2013 by annambowman in Dallas Area Reviews and tagged Dallas attractions for kids, Dallas reviews, family fun, family fun in Dallas, Lego Land review.